Check out the new collections of such famous brands as Aletta, Armani Baby, Burberry, Early Days and a great number of other renowned trademarks that continue to create fascinating designs for baby boys. Have a look at a stylish outfit offered by Aletta. It consists of fashionable jumpers combined with a white long-sleeved shirt and added with a pair of stylish shoes. Such an outfit is not complete without a bow-tie by Dolce & Gabbana. Choose the one you like most and your baby boy will be ready to go. Early Days offers a pair of stylish dark-blue shoes that can be worn together with the Burberry trousers. This can be worn at special events like Birthday parties on which your child will definitely look his best. Another option is a long-sleeved shirt by Dolce & Gabbana. It can be combined with the stylish trousers for the outfit of your child to be complete. The shirt is made of a light cotton material that is soft and delicate to the touch and is easy to clean and wash. It can be combined with a sleeveless waistcoat by Armani Baby. This will be a perfect option for your young gentleman. Your baby boy will adore wearing such clothes and footwear as they are not only comfortable, but also look stylish and trendy. All clothes and accessories are made of the best-quality materials and are characterized with durability being resistant to wear and tear. If you are looking for comfy and stylish clothes for your baby boy, the above designs would be your best choice. Don’t hesitate to look through the collections of world-famous designers who know perfectly well what every child wants to wear. You will be surprised by the exceptional quality of every piece of clothing and this is an important aspect to consider when choosing kids’ wear for your baby boy. If you are looking for fashionable and trendy clothes for your baby boy, you’ve arrived at the right place. 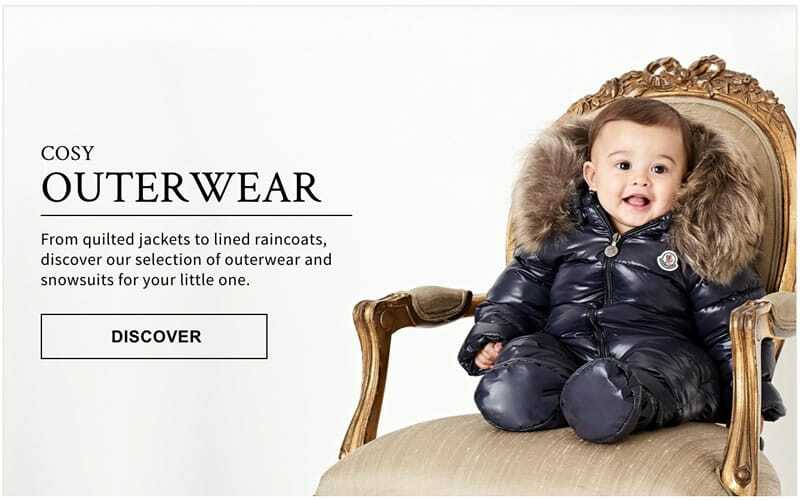 Check out the collections of Dolce & Gabbana, Armani Baby, Burberry and Early Days to find a number of amusing outfits for your young gentleman. Aletta offers a nice outfit for wearing at special events. It is comprised of a blue jumper and a white long-sleeved shirt that can be added with a bow-tie by Dolce & Gabbana. It will be a perfect solution if you are searching for clothes of an excellent quality and at the same time something stylish and elegant. We offer a number of other luxury clothes for baby boys of different ages. Armani Baby provides a dark-blue waistcoat that can be combined with a white shirt by Burberry. Such an outfit will definitely be to the taste of your child, and he will be delighted to wear such elegant and luxurious clothes. Burberry also offers dark-blue trousers that can be matched with a pair of shoes presented by Early Days. This will be an excellent choice if you are going to a Birthday party where your child should look his best and stand out from the crowd. In such clothes, your baby boy will not look like anyone else and such outfits will help to reveal his personal style and taste in fashion. All clothes presented in the collections of the brands are made of the finest-quality materials and fabrics that are durable and functional. The quality of every piece of clothing will hardly leave you indifferent and you will be surprised to learn that the prices are quite reasonable considering that these are the creations of world-famous designer trademarks who have long gained a reputation of trustworthy and reliable companies providing exceptional clothes for baby boys.